No group classes in August. We are available for Private Lessons ($75/hr for one instructor, $130/hr for both instructors, + room/space rental fees, typically about $15-45/hr). Contact us here. By invitation only. For our most recent Level 200 alumni who always use smooth "linear flow" for everything, and are skilled at rotational leads and preps. See description below. ​Special 6-week series. 9 hrs total, tentatively $180. For Absolute Beginner through Intermediate(+). Also highly recommended for people who have other partner-dance experience and want to learn WCS really fast, without having to plow through a standard slow-moving Beginner class. We will learn and rapidly improve our WCS by focusing on how Advanced dancers actually dance. What do they actually DO that makes their dancing so effortless, and makes them able to do 100 fancy moves with no strain? We will focus on 7 partnered-movement building blocks. Snap these together, and we can create all the Basic, Intermediate, and Advanced WCS moves & patterns with the same ease as Advanced dancers. ​ This is a totally different approach from standard WCS memorization-based classes, and therefore offers an excellent acceleration for all WCS dancers. NOTE: Absolute Beginners very welcome – you will not feel lost at all. ​ At the end of the course, we will all take a "field trip" together to a local WCS dance. You will be amazed at how good you are, and how happy everyone will be to dance with you! ​Come join our unique Beginner & Beyond Intensive Class in West Coast Swing! Absolutely no prior experience or partner needed. (If you do have prior dance experience, we use it to maximize your learning!) We start with the 5 Fundamental Building Blocks of WCS that snap together to create about 100 different West Coast Swing moves. With this unique teaching approach, you'll effortlessly learn more moves ... and good technique ... fast! Be amazed as we learn over 20 moves in no time flat! • NOTE: This studio does not permit street shoes. Bring clean suede-sole dance shoes, or your best socks! See more details about clothing & shoes below. • Alumni who are taking 201-205 may stay and participate in 101 for FREE — in either role! Levels 201-205 are a rolling syllabus of skills and moves (patterns). New material every time. With a focus on polishing our "partnered-movement" skills that make all of it work effortlessly. - For everyone who has completed our Level 101 course. We continue beyond, beyonder, beyondest! - For everyone with some WCS experience who wants to understand WCS better, deeper (and sillier). • Prerequisite: Our totally unique Level 101 class is required for Levels 201-205. No exceptions, sorry. You may take them at the same time (see discount combination price below). • Bonus: Level 201-205 students who have already taken our Level 101 class are welcome to stay and participate in Level 101 for free! You will be on "stand by" if you don't mind, and you are invited to learn (re-learn) either role. WCS - Level 300: Super Stars! 7:30-9:30 pm - 4 weeks - 8 hrs total - $100. A special offering for our Level 2 (201-205) Alumni. Think of this as semi-private lessons, specially tuned to exactly what you want and need to zoom forward in WCS. We'll improve and expand our toolkit of skills, and focus more on dealing with cool, tricky moves / patterns than in previous classes. You're ready, and we're ready! NOTE: This is our last super-bargain priced class. After this, classes will be at regular prices. So join now! • Prerequisite: By invitation only. For our most recent Level 200 alumni who have mastered using smooth "linear flow" for everything, and are skilled at rotational leads and preps. Why our Intensive Classes? It's all about the teaching! Our unique "building blocks" teaching approach will get you out on the dance floor fast - having a great time - meeting new people - while continually getting better! 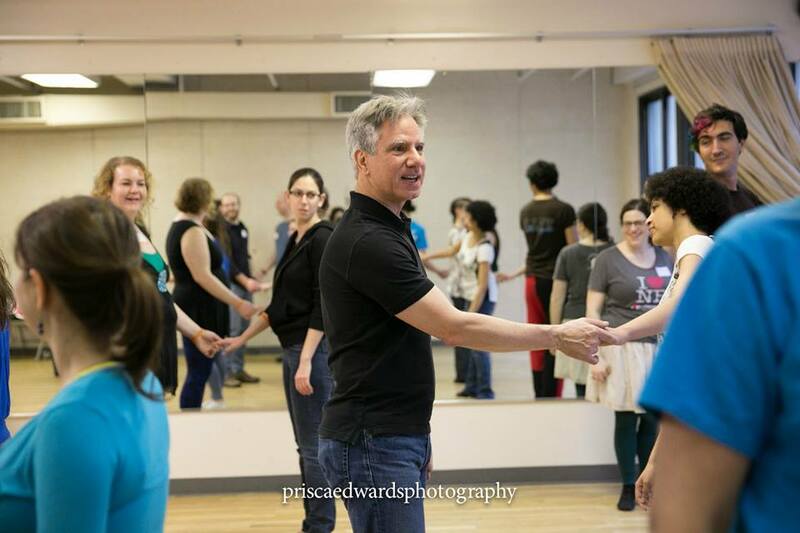 Our classes themselves are friendly, entertaining, highly social, and packed with dancing! If you want to understand WCS fast — or if you want to supplement your other WCS classes to boost your learning and technique — come join us! ﻿FLY OUR FIRST CLASS FREE! TRY US BEFORE YOU PAY! RSVP via the "PRE-REGISTER" button and then join us for class. We do all registration finalizing (payment) at the END of your first lesson, to guarantee your satisfaction! If you like it, then at the END of the first lesson, pay! If our approach to WCS doesn't grab you - no worries - and no fee! Really. We're happy you came and tried us out. NOTE: Does not apply to classes held at You Should Be Dancing Studio — they have different policies. ​Ken Kreshtool: Internationally ranked West Coast Swing competition dancer. "The best instructor I've ever had in ANYTHING!" — Harvard University students' comments, 6 years in a row, for his on-campus dance classes (while working on a PhD there). West Coast Swing (WCS) is a partner dance, a smoother and highly sophisticated form of Jitterbug or Lindy Hop-style Swing dance. It kept evolving in California during the post-WW II decades when Jitterbug itself (aka Lindy Hop) went dead or dormant for 50 years. It has continued evolving dramatically even today, adapting to new music and new dancers. Over the years, it has "borrowed" (stolen) almost every cool move, turn, dip, and styling from Lindy Hop, Salsa, Hip Hop, Country, and booty-shakin', and even some Ballroom, Zouk, Tango and Blues. West Coast Swing has one of the biggest vocabularies of moves and combinations of any partner dance — and the widest range of music styles. At the same time, WCS Followers have more freedom for improvisation, and both partners have more freedom for musical expression, than in any other partner dance. WCS is the easiest of the Swing dances to learn (if you have the right teachers — that's us! ), but perhaps the most challenging to fully master. It's hugely popular on the West Coast and in Europe and South America. Come get in on the fun as it sweeps the East Coast! • For Level 201-205, you must have taken our totally unique Level 101 class — you can take it at the same time. • For Level 300, you must have taken at least one of our unique Level 200-series classes. Note: This studio does not allow street shoes. Please bring dance shoes (clean soft suede soles) or socks. To guarantee your satisfaction, all registration payments will be taken at the END of the first lesson! If you like it, register and pay; if you don't, no charge and thank you for trying us out. You are also welcome to pre-register and pre-pay online to guarantee yourself a place in the class. Note: This studio does not allow street shoes. Good footwear: Any clean dance footwear that lets you spin comfortably is fine — dance shoes, dance sneakers, Toms, even socks. Clean suede soles are best. Pulling large, thin socks/footies over your shoes or sneakers works surprisingly well. Low heels or flats are best for WCS. Bad footwear: Grippy rubber soles are bad — your knees will die. NO SPIKES OR HIGH HEELS, PLEASE! Salsa heels, Tango heels, even character shoes, do NOT work well for WCS. NOTE: Please change into your clean dance footwear in the lobby area after arriving, to preserve the wood floor. If it rains or snows, definitely change into clean, dry footwear after arriving. Thanks. WHAT ELSE TO BRING: (a) All you friends! (b) Water. Maybe a snack. (c) An extra shirt. (d) Carry your dance footwear and change into it/them after you arrive. (e) Gum. Toothbrush. Deodorant. Please. (f) A smile! GENDER NOTE: Our classes are non-gender biased. Dance whatever role(s) you like. We'll probably all try both roles at some point, as part of learning faster and better. ARE THESE THE WORLD'S BEST WEST COAST SWING BEGINNER AND INTERMEDIATE CLASSES? DROP-INS PERMITTED? Not really. Our class is cumulative — each lesson builds on all previous lessons. • However, if you are visiting from out of town and want to attend one lesson, to see what the World's Best WCS (West Coast Swing) Classes look like <insert modest cough here>, please contact us and we'll almost always say yes. We may ask you to sit on the side if we think that day's topics require preparation that you don't have yet, but we won't charge if we do that. • We are very reluctant. We want you (and your partners in class) to be happy! Not frustrated! Our class is intensively cumulative, which is how we learn so much so quickly and easily. Please come to the first lesson! Thanks for understanding. • If you absolutely cannot attend the 1st lesson, contact us about starting at the 2nd lesson. We'll probably say yes. • Start at 3rd lesson? No, sorry. We cover so much ground in the first two lessons, that we have never had anyone successfully start during lesson 3. We used to allow it, but everyone who tried it, dropped out in frustration. (We gave them a full refund, of course.) We want you – and your partners in class – to be happy! Not frustrated! So we ask you to wait until our next class series starts.